A team from Medicine’s Faculty Education Office are raising money for the charity Days for Girls, supporting a team of MBBS students heading out to rural Nepal in May. In 2016, the School of Medicine collaborated with the ICSM Students’ Union and charity Community Action Nepal, to produce ‘Imperial College Enables’, giving students the opportunity to experience healthcare systems entirely different to that of the UK. 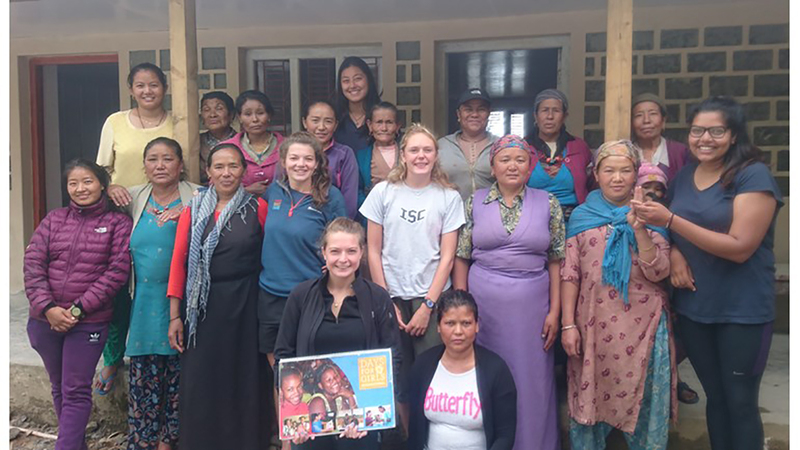 The project grew in 2017, and from the work the students did on their visit to Nepal came a relationship with the charity Days for Girls, which supports young women around the world by distributing female hygiene kits and education materials about menstruation. Many women in rural Nepal struggle to manage their periods, some using rags and many forced to stay indoors for the duration, and the level of education about menstruation is low. During the students’ visit, word spread quickly between the rural communities, and many women walked many miles to a health post to collect a hygiene kit. The students soon ran out of the kits, which are colourful bags containing washable sanitary pads and underwear. Each kit can last up to three years, and costs just £5.14 to produce. The kits are also sewn and put together in Nepal, offering the extra benefit of employment for local people. In May 2018, students will return to the Nepalese health posts previously visited, as part of a new second-year MBBS module, Clinical Research and Innovation. The aim is to prepare these students with 1033 hygiene kits – the number of female students currently in the School of Medicine. The FEO team spearheading the fundraising initiative alongside Head of MBBS Years 1 and 2, Professor Mary Morrell, are Jo Williams and Margaret Rodger, Programme Officers for MBBS Years 1 and 2; Hannah Pietruszewska, Education and Finance Officer; Labbie Farrell, Programme Assistant for MBBS Years 1 and 2; Emma Blyth, Instructional Designer; and Agata Sadza, Blended Learning Specialist. To produce the planned 1033 kits, the team need to raise £5380 by Friday 18 May. Along with assistance from other FEO staff, they have put together a charity cookbook, available at a suggested donation of £5. You can get your hands on a copy by getting in touch with Hannah Pietruszewska at h.pietruszewska@imperial.ac.uk, and lend your support more broadly to the initiative, by donating on the team’s JustGiving webpage. Imperial College Union’s Project Nepal will also take the kits and educational materials to other remote areas of Nepal later in the year, and the team would like to note their thanks and appreciation for the considerable sum already raised by the society, for which they are extremely grateful.